Fresh foods and their role for your disabled rabbit. Vegetables and their role for your disabled rabbit. While hay should be the foundation of all rabbit diets and the primary source of vitamins, fiber, calcium and other nutrients, fresh foods are the next most important part of your rabbit's diet. Fresh vegetables provide additional nutrients and serve to create a balanced diet made up of different textures and tastes. Vegetables are also an important source of moisture, which is important for bladder and kidney health. For a disabled rabbit, moisture and fresh nutrients are critical for health and thus vegetables should not be an overlooked part of their diet. When introducing any new vegetables, go slowly. Start with small amounts and give your rabbit time to adjust before you feed any vegetables in larger quantities. Also, be sure that your rabbit has been eating grass hay for a minimum of 2 weeks before you introduce them to any vegetables. Fresh vegetables are made up of both leafy vegetables and non-leafy vegetables. There are a number of different fresh vegetables of both varieties to choose from, each with its own taste and texture. Try to find the ones that your rabbit likes the most. 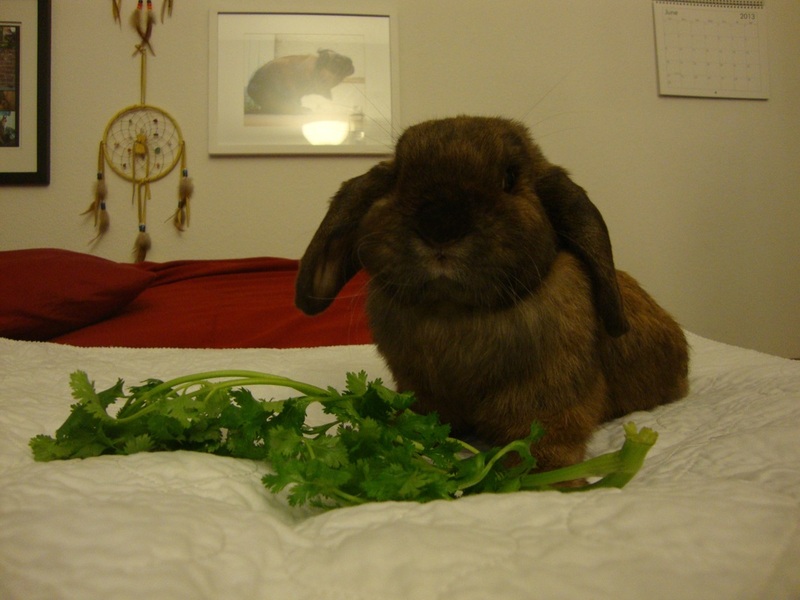 Your rabbit should be eating approximately 1 cup of packed leafy greens per 2 pounds of body weight once per day. Your rabbit should be eating approximately 1 tablespoon of non-leafy vegetables per 2 pounds of body weight once per day. Fruits and their role for your disabled rabbit. Bonnie shares an apple with her humans. Fruits make up a small portion of available fresh foods for rabbits and are a sweet treat that most (if not all) rabbits enjoy. They are great in taste, texture, moisture and vitamins and minerals. However, fruits must be fed carefully. Fruits are high calorie, high sugar foods that, in the wild, rabbits would only find on a special occasion. Rabbits will naturally gravitate towards these sweet tasty treats over other foods, but they do tend to lead to excess sugar and calories, weight gain and can potentially lead to gastrointestinal upset. In disabled rabbits though, weight gain may be a good thing. Just monitor their intake carefully and do not feed much more than is recommended so as to avoid too much sugar. Watch their droppings for signs of any digestive upset caused by too much sugar and be sure they are eating enough hay. When introducing any new fruits, go slowly. Start with small amounts and give your rabbit time to adjust before you feed any fruits in larger quantities. Also, be sure that your rabbit has been eating grass hay for a minimum of 2 weeks before you introduce them to any fruits. Your rabbit should be eating approximately 1 teaspoon per 2 pounds of body weight once per day.